Like many (if not everyone?) my hubs took a hit fron the two panda updates, a mild hit with the first update and a bigger hit with the second update. I am no expert in these matters but it would now seem that getting ones hubs to rank is probably the same work as it takes to rank our own sites, since the “hubpages” overal site power is diminshed. It left me asking myself a few things – first and foremost – is it worth continuing putting time and/or money into backlinking my hubs, especially if you are paying for outsourced unique articles and/or taking the time to write unique articles yourself. Personally, I have been put off this idea. However, I am going to use a combination of “well-spin-articles”, and send them to sick submitter where I can send them out to many article directories (over time, not all at once of course). This way I can justify my time spent backlinking my hubs because it will be a lot less of my time spent. It’s an experiment, and I will see how it goes! Since all (but one) of my hubs have tanked from the first page to the 3rd and 4th pages in google, I got nothing to lose anyhow, and I will focus on PR and BMR for the rest of my backlink building for my own sites (especially the ones that survived and actually thrived after Panda). Thats why I decided to spend some time on this and find out Darren – no one seems to be doing any real experimenting they are just running around panicking (including HP staff) – I’d like some facts! I started my experiment 2 days after Panda 1. Lost traction for main keyword phrase (went from 1 to 8) and completely vanished for the semantically related ones that were sending good traffic. Not in the results at all for one – 97 for another. I have too many hubs to do this with but I chose 4 that were the most profitable. No gains in almost 2 months of aggressive linking. Interesting experiment Darren- let us know how it goes – I agree if its as much work to rank a hub as your own site – you are far better off with your own site. Hey Lis, yep – will do. I am working away on it now, spinning like a top! I don;t want to give up on my hubs yet until time, and facts 🙂 , get more clear. I will check back in with how things are going. SOmething else to take into account (and this might be a bunch of crap in my head), but hubpages maybe put on a time penalty for a while? Maybe the more experienced about theses things can pitch in with their opinions on that one. Either way, link building efforts will show their affects down the line, one way or another. This should be interesting, my hubpages have seen a drop, about a third less traffic and a third less income, my strong hubs are still doing well, in other words the ones I have backlinked, the ones I never sent any links to have pretty much lost all their income but overall it hasnt been too bad. I tried out hub ads for a while and I made much less than with adsense, so I switched back. Im not including my amazon sales from hubs in this but overall my amazon earnings have remained fairly stable so not much difference there. Im not pulling my content as long as its still earning but Im not going to put time into backlinking the non performing hubs. Alana – yeah the income drop is similar to mine I think – and yes the stronger hubs haven’t dropped as far – they are the ones I want back! The trouble with backlinking is that if you don’t do it you almost certainly won’t get anywhere (with the new HP) – in which case you might as well put content on your own sites. BTW nice to talk again – long time no hear- how is infobarrel going? Hey Lis, yeah its been a while, in truth I didnt stay long over at IB, started freelance web design and working on my own sites, interesting thing this month with my hubs is that im on track so far to make the same as i did in the month pre panda on adsense alone not sure what to make of it yet but affiliate sales up too, you notice any changes recently? Yeah I’ve had an outsourcer building hubs and backlinking them for the past 6 months. It’s probably been the worst timeline decision ever since it was around that time that hubpages started to be a lot harder to rank, and now with the panda update I’m only using the site to build pages that I also want for backlinks. I wish hubpages worked as they used to. I always saw them as a bit of my nest egg (ie if I ever decided to sell and get out of the game I’d still have a little flow of money coming in with 0 work or expense). Oh well… It’s all the name of the game… I just need a little inspiration for my next project! I have been wondering how Panda/Farmer impacted Hubpages on a broader scale (several of my Hubs saw a small decrease in Google traffic) and it great to see someone with a strong HP presence publish some real data. Thanks for all you do and the insight you provide! On another note … did Panda have much impact on site developed using the KA approach? Hi Jim – yeah long time no see! My other sites which are all based on keyword academy approaches with variation – are doing just fine – some up some down – all normal – the only stuff of mine that Panda touched was HP! I’ll be interested in the results of your experiment. Given the amount of crazy stuff going on at HP, I’m guessing that they will find it difficult to regain their former position. Either they haven’t got a clue, or they’re very cleverly getting rid of a lot of people and hubs that won’t fit in with their own advertising scheme. Anyway, If anyone has a lot of hubs that they want to download to their own computer, I’ve made a short video that shows you how to do it using Firefox and the Scrapbook addon. After you’ve downloaded the hubs, the content will still have the HP HTML tags in it. You can clean this up by pasting the hub content into a good text editor that can strip out the HTML content, and leave pure text. I use Notetab Pro, available at http://www.notetab.com but many other editors will do this for you. Yeah who was it that said never confuse incompetence for strategy – or words to that effect! I’m doing the same thing right now with my hubs. I fully agree that while the Google update may have been a major bump on the shins for HubPages, their reaction seems to be actually shooting themselves in the foot. I’ve had several hubs based around some decent Clickbank products, and I’ve basically copied and pasted the text of those hubs, deleted all the info, and then left a 750 word text article behind as my “updated” hub to use as a backlink while the 3,000 word article gets moved to my own site. Just looking at it now, there’s little doubt in my mind that I’m going to end up having to delete about 50 hubs because they’re now more valuable on my own site. I’ve been making some backlink runs at hubs where I also have a website because I’m very curious if it now takes more work to rank a hub than a website – which if it did would make the next step pretty obvious, IMO. Is there a quick and dirty way to back up your hubs? I’m hoping there’s a better method than “Save page as…” multiplied by a couple hundred hubs. I am going to be watching your experiment with bated breath. I have see mixed results with my hubs, but many of the hubs that were doing really well with Ebay and Amazon, have not done well with the new text to product ratio. My traffic is sitting at about 1/3 of what it was previous to Panda. Yeah I must say that I haven’t done much with Amazon or ebay – in fact I was just going to ramp up Amazon – oh well! Can you text links for Amazon – ie direct links to the product page – that is often quoted as the best CLR from people who do serious Amazon – but I’m not sure if you are alllowed to on Hubpages? Direct linking to the Amazon product page was allowed under the pre-Panda Hubpages TOS, and so far none of mine have been taken down. But I wouldn’t be surprised to wake up and find them gone one morning. If Hubpages had sat tight, they’d already be on the way back up. The initial shock of Panda was pretty strong stuff, so I can see why they panicked, but panicking gets you nowhere in this business. Glad your sites are doing well, Lissie, and looking forward to the data you’re going to get. Lis, I’ve been keeping an eye on Hubpages (vs. Squidoo) in the whole Google Panda update, looking at the same data that you have — I think Quantcast is a better indicator than the Sistrix/Searchmetrics studies of Panda’s impact. I have one perspective to offer, of which Squidoo members who also write on Hubpages are aware, but Hubbers may not be. In summer 2007, Squidoo got caught by Google with an anti-spam penalty and had to institute a lot of new policies (and filters) to block what Google had penalized. There was a lot of confusion, frustration, and dismay. Some affiliate marketers weren’t able to work with the new system. Many members left; many analysts declared that Seth Godin’s “purple albatross” was dead. Even those of us who weren’t affiliate marketers (back then, that is) saw a dip in traffic for two months. But Google took note of Squidoo’s aggressive spam removal and new filters, and slowly the traffic came back — and kept going up. That Squidoo slap was a site-wide penalty; it hit original, educational articles as well as the most mindless spam. 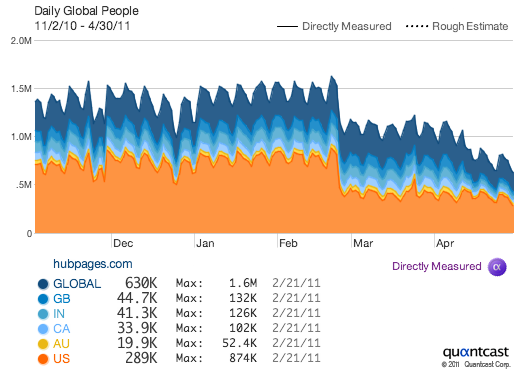 The Panda update has some site-wide factors in it, apparently, which are depressing everyone’s traffic. The good and bad news is that I believe all the Draconian measures Hubpages is taking are likely to get it back in Google’s good graces, as Squidoo’s 2007 changes did. (Significantly, Squidoo seems almost untouched by the first two rounds of Panda, probably because we already went through this.) This is going to be a rough and rocky period, and Hubpages changes will make it impossible for people to do some of the things they did before. You just knocked back on your heels. But not out. IF Hubpages — the company — can survive the hit to its income, it should see at least some returning in a month or two. Of course, that’s no help if it’s locked all your Hubs and it’s too much work to try and figure out the rules. But long-term, while this is a blow, I’m fairly optimistic that Hubpages will recover. geekgeek thanks for your helpful comment – I actually started on hP about the same time as the Squidoo slap – which was why I went with HP rather than Squidoo – so your perspective is a useful one. It looks like all article sites are affected after this update. Hey Lis, It would be nice, if we could see a year’s worth of stats. That way, we can see any seasonality fluctuations in your hubs. I don’t have many hubs, but most of my niches start to slow down this time of year. Hey Lis, great analysis. I think the big problem is just putting your content in a place where you don’t have control over the whole presentation. Many people with great hubpages were pulled down by people who didn’t focus on quality, as well as the strategic decisions by the company itself. Developing and managing your own site isn’t that complicated, and it gives you the control you need to present the best quality you can. If it wasn’t this, it would have been something. I agree Fraser – and I think now Google is putting more emphasis on ALL the site’s content not just an individual page – which I think is Hubpages downfall – I’ll be avoiding them and similar sites in the future and concentrating on my own! This will be interesting. I have just started writing some hubs and working my profile to try and get some backlinks to a site of mine. The recent changes and attitude of some hubbers have made me little concerned, most people are nice but there are some who quite right down mean. It takes away community experience I felt earlier. For time being, I am also going to work on my site and create others.